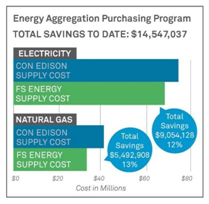 The FS Energy Aggregation Purchasing Program leverages the combined energy utilization of hundreds of properties managed by our parent company, FirstService Residential, to successfully negotiate lower-than-standard rates for natural gas and electricity from local utilities – enabling our clients to pay considerably less. When aggregated groups purchase large blocks of energy, they can benefit by negotiating discounted prices. In the last three years, buildings that participated in the program have saved $9,054,128 in electricity and $5,492,908 in natural gas costs – up to 13% less than rates charged by Con Edison and National Grid. Properties that are part of an aggregated group remain customers of their natural gas or electric utility company. Each building is quoted its own price based on its load profile while also benefitting from reduced supplier margins and other expenses. Buildings can choose a variable (index plus adder) contract or a fully fixed contract. Energy prices fluctuate constantly, which can significantly affect your property’s energy bill and performance against budget. By taking a proactive approach to buying energy, you can better control your costs. FS Energy specializes in purchasing energy on behalf of properties managed by FirstService Residential. We can lead you to strategic energy procurement that ensures you’re getting the best value for your energy dollar. We identify strategic sourcing opportunities by constantly monitoring market dynamics to identify the best possible purchase opportunities. After your property indicates a willingness to participate in an RFP, FS Energy will send the energy load to the supplier community. Our energy experts review all responses and recommend the best option based on key factors like pricing, contract terms, product structures and credit conditions. When you approve a recommendation, FS Energy handles the transactional process and completes all legal documentation. If your property is interested in procurement services, please email us at [email protected].